Nahan is a town in the state of Himachal Pradesh. It was earlier the capital of the former Simur princely state. It is located overlooking the Greenhills in the hilltop of Shiwallik Hills. The town is far from the hustle bustle and noises of big cities. The people of the town are simple who find happiness in the peaceful greenery of the hills. The Mall road is one of the most common places for the common local people to roam around in the evenings. Even the tourists tend to follow the unsaid custom of taking walks in the evening on the Mall Road. Apart from these, there are many religious places which one can visit on their trip to Nahan. Some of them include the TrilokpurTemple, Shiv Ji Temple,Saltevni, Kalishtan Temple, Miyan ka Mandir, Shiva Parvati Temple which is 300 years old, Mata Balasundari Temple which is located in one of the city’s main hub i.e., Hospital Round, Lakshmi Narayan temple and others. 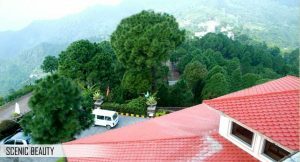 Grand View Resort provides a perfect getaway from all the hectic schedules on the green Shiwalik top hills. It is time to get your registrations and bookings done to this peaceful town which is far from the everyday commotion and noise of big cities. After all, some peace is what everyone seeks!